Hailing originally from Venezuela, and now based in Barcelona, Fur Coat’s story is one of passion for techno and electronic music. It’ s a tale of deep, dark driven beats and rolling grooves that both encapsulates the mind and moves the feet. It was this love of music that in 2004 brought Sergio Muñoz and Israel Sunshine together and led to a musical intertwining which would drape itself over the shoulders of the music industry. In 2010 Crosstown Rebels founder Damian Lazarus unearthed Fur Coat and promptly signed and released their debut EP “Space Ballad”. However It would be their release ‘ You and I’ featuring vocals from Cari Golden in 2012 that would put the name Fur Coat on the tongue of weekend warriors across the globe. ‘ You and I’ became a global anthem and added fuel to the Fur Coat fire that was already blazing bright. Their debut album ‘Mind Over Matter’ quickly followed and was a smooth blend of club bombs and downtempo grooves that received rave reviews. As a result the guys found themselves racking up the airmiles and rocking the dance floors of the most prestigious clubs in the world on a weekly basis. Their longstanding friendship and musical kinship came into its own when in the DJ booth, seeing them able to piece together breaking sets and wowing crowds at clubs such as DC10 in Ibiza, Watergate in Berlin, The Warehouse Project in Manchester, Rex Club in Paris, Fabric in London, Verboten in New York, Warung Beach in Brazil and many more. April 2014 saw another landmark as the guys released their first original material since Mind Over Matter. ‘Theres No Time EP’ came out on the much hyped Hot Creations imprint from Jamie Jones & Lee Foss, followed quickly by ‘The Right Move EP’ for Ellen Allien’s legendary Berlin imprint Bpitch Control, which featured the vocal talents of Jaw from DOP, again cementing Fur Coat’ s name at the top of the industry. 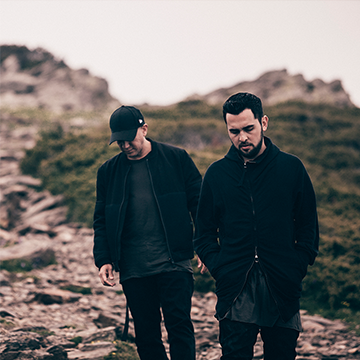 September 2014 saw the duo’s much anticipated return to Crosstown Rebels with the killer ‘U-Turn EP’ and its eponym lead track adding a new global dance anthem under their belt. On top of another year of intense touring, it led them to enter the prestigious RA Top 100 Poll straight into the 66th position. When most of the other acts would have stuck with the same tested recipe for success, 2015 was a year of change as they evolved their production prowess towards a darker techno sound, delivering bombs that both implode and mesmerise the dance floor at peak-time. This change didn’t go unnoticed, coming with reworks request for Stephan Bodzin (Systematic Recordings), Ruede Hagelstein (Watergate) and GoldFFinch (Turbo) all of which broke into Beatport’s top 10 techno charts. Their dexterous skills were promptly picked for the infamous Balance mix compilation series and for the highly respected Essential Mix on Pete Tong’s BBC Radio 1 show. On the production side, industry legend Sasha released their ‘Katarsis’ EP on his revered label Last Night On Earth describing their productions as “great dancefloor records […], the perfect records for the middle of the set that can really take the roof off the club”. 2016 has been another excellent year for Fur Coat with releases on Watergate Records, their awaited return on Crosstown Rebels and stellar remix work for Edu Imbernon, Nicole Moudaber and Matador. Add on top an endless touring schedule and it’s not hard to see why Fur Coat’s rise shows no sign of stopping.